I havent been on here for so long, i dont see much activity which makes me feel better knowing everyone is just as busy as i am. 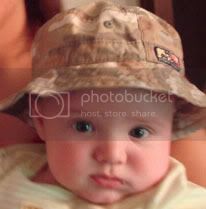 Tammy, i see Andrews pic on photobucket what a handsome little boy and a big boy !! the babies are doing really really well... only ONE major problem, i cant get them to sleep through the night without waking up for milk, i wonder if its because i havent started them on solids just yet. Not sure but im just hoping they will get through the night soon, i really need to get some rest, i have been taking care of the babies all on my own during the day, 12-13 hour days so by the time DH or mom comes home im exhausted beyond comprehension. this too shall pass.... Im still working on the weight loss, considering a triplet pregnancy leaves lots of excess fat and skin and stretch marks up the a$$. Vita: Thanks for the compliments on Andrew. Yes, he is a big boy. I have not yet started Andrew on solids, but plan to soon. He is 4.5 months old now. I will probably start him at 5 months. His doctor said to start him between 4 - 6 months. Regarding weight loss, the breast feeding really helps!!! I've lost all of my pregnancy weight (35 lbs) and 4 additional lbs. I don't see how you manage with three! If I do not get my sleep, I have a difficult time dealing with day to day issues. I am a different person if I'm well rested. Andrew will have a few nights of sleeping 7 hours without waking and then it is back to 5 - 6 hours. I was driving home from my night class last night and saw DH pushing Andrew in his stroller. I pulled the car over to the side of the street and jumped out. Andrew was so glad to see me. He kept smiling and smiling. Having DH watch him 2 days a week has really created a strong bond between them as well. He loves his daddy! Jo: Congrats on you and Ellie being on television. Hello to Kareen, Heather, Zoe, Justine, Cla and anyone that I have missed. Last edited by JustinesBaby on Sun May 11, 2008 8:02 pm, edited 1 time in total. Wow this is quiet here! Hope you are all enjoying the sunshine or lack of it! Our babies are all growing up too fast. I can't believe Ellie is 37 weeks already. She is doing brilliantly. She's a chunky 16lb 12oz. She's still not rolling or sitting. I think she's just lazy. She's being referred to physio as she is a bit stiff on her left side. It could be down to laziness but there's always a slim possibilty she has cerebal palsy due to the bleed she had on day 2 and her prematurity. She is still on her oxygen but they turned it down slightly the other day after having it turned up last month. Everyone else here is good. Hannah did really well on her exams. Emma had her ears pinned back at the beginning of the holidays and they look fab. We've just been offered a bigger house which is just round the corner so that's great news. Lots of work but worth it in the end. Hope you are all well. Looking forward to hear about your little ones. Me 35 DH 37 1st IVF ET 27 June - BFP!!!! Ellie was born on 11 December 2006, 14 weeks early! Justine: Wow, Nick is doing great!! Thanks for the compliment on my "little guy". Jo: Andrew has been rolling, and sits for a little while and then topples over. His right neck muscles were stiff and he has been going to a physical therapist for a couple of months now. He used to favor his left side, but now is doing well on his right side as well. We only go once a month to the physical therapist now. Maybe that is all that Ellie needs. Wow, she is getting big. 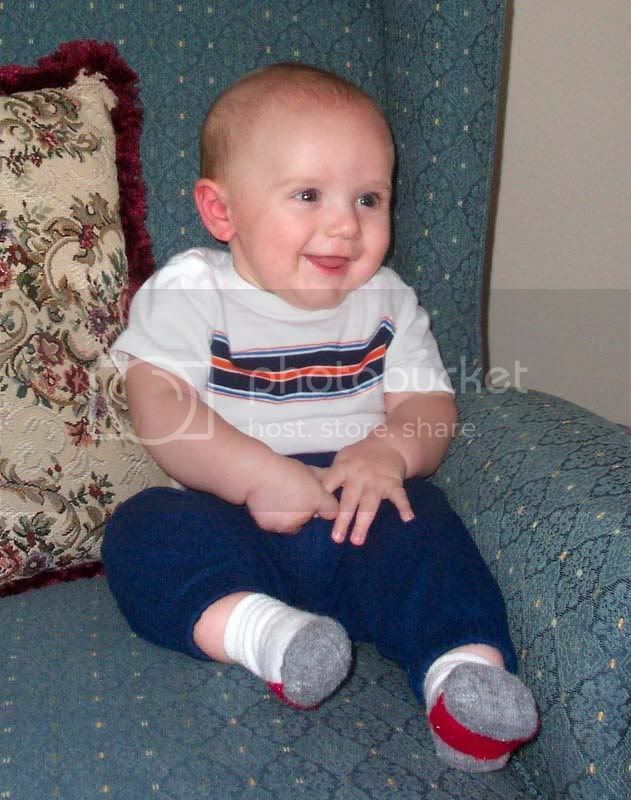 Andrew had his 6 month appt. 1 week ago and weighed in at 18 lbs 14 oz and was 27.5" long. He has two bottom teeth coming in now. Andrew has not been sleeping well at night!!!!!!! He went to bed last night at 9:00 pm, woke at 10:30 (gave him his pacifier), 11:30 for a feed, 12:00 with a night terror, 2:00 for a feed, 3:40 for a feed, 5:30 for a feed and DH got him up at 6:20. I went back to bed until 8:20 when he nursed and went down for his morning nap. He is flourishing, but I am barely able to make it through the day some days. Does anyone have any ideas? He has been on solids since ~5 months and currently eats two solid meals per day. He still nurses quite a few times per day though. He just does not nurse for as long of a time. I have posted a recent picture of him. This was taken a few weeks ago. Last edited by JustinesBaby on Sun May 11, 2008 8:03 pm, edited 1 time in total. Thanks so much for the advise on Andrew's sleeping problems. I do have a dim light on in the corner of the room, just so it is not pitch black and I can see to pick him up to nurse. He is teething, as he just got his two bottom teeth. With the exception of two night terrors last night (one at 9:45 and one at 10:30), he did better. He went to bed at 9:10 and nursed at 1:30 and 5:15. He was ready to get up at 6:00 am, so DH got up with him so that mama could get some more sleep. He has also started eating more at his two daily meals. I'm thinking about starting the third meal now. He normally eats breakfast around 10 or 10:30am, just after his morning nap and dinner around 6 - 6:30 pm. Maybe I should try a third meal, lunch around 2:30pm. I only gave him two solid meals, since he was not even eating all of them. Yesterday, he ate like a champ at both meals, so maybe it is time to try a third meal. He loves sweet potatoes and squash, but hates sweet peas. He also likes bananas, pears, apples, prunes, oatmeal and yogurt. I try a new fruit or veggie every 4 - 5 days. A two hour drive to work is dreadful!! I teach part time at two different universities. One is a one hour drive from my house and I teach there twice a week. With not getting much sleep, it has been a challenge to drive there every Tues/Thursday. My DH and I coordinate our schedules so that he comes home from work on those days at 1:30pm to watch Andrew and I leave to teach a class 3 - 5 and one 6 - 8. The other classes I teach are both online, so we do not have to use daycare. I just can't put him in daycare, as my friend has a daughter in daycare and she is always sick. Thus far, Andrew has not been sick. Good luck on the house hunting! oh my.... its been a while !!!!!! how are you all doing? im well... andrew and katie are doing great... they are so much fun but its pretty tiring during the day.... trying to keep them entertained is quite draining!!!! I hope its ok that I join you.. I am somewhere in-between the winter 2006 and Summer 2007 babies (Kennedy was born in May 2007) I remember most of you ladies and watched all your stories.. I hope all is well.. We are doing great..
Kareen: Andrew and Katie are cuties! How do you get them to sleep 12 hours without waking up?????????? Help! Do you have them in your room, or a separate room? Are you breastfeeding? My Andrew has totally reverted back to getting up 3 times a night. At 4 months he was sleeping 5 - 6 hours without waking, but now he goes down at 8:30 or 9:00 and gets up every 2 - 3 hours!!! I don't know what to do. His crib is in our room and I am still nursing him. I thought he may just want me to comfort him at night when he wakes up, so last night I tried to just give him his pacifier and pat him on his back. He woke up every 45 minutes!!!!!!!!! I finally nursed him at 1:45 am and then he slept until 4:30ish. Justine: When will you have to go back to work? I am not going to teach at the university that is 1 hour drive from my house next semester. It is just too difficult to drive with very little sleep. I'm going to add classes at the college close to my house. That is great that you found a house. Jo: I saw that Ellie is off of oxygen. That is great!!!!!!!! Vita: How are the babies doing? How are you doing? Heather: How are you and Griffin doing? Hello to anyone that I may have missed. My trio are doing incredibly well.. THANK GOD... we have their Christening coming up towards the end of the month, so it should be very exciting. All three have popped out a tooth except one got 2 within 3 days apart... they are all sitting up and rolling all over the place, although they have not begun to crawl, dr said it was ok according to their adjusted age. Things are looking well so far...only problem is the sleep, they dont sleep well at all, they wake up at least 1-2 times a night, the downfall is that they are all in the same room an have a tendency of waking each other up. It gets stressful and very exhausting when i dont get sleep, because the next day i take care of them all by myself until my DH gets home around 7 pm and by then its bath/bed time. Its been difficult but not impossible, i love being with them. I still have 30 lbs to loose, its almost impossible to diet with the lifestyle i have now, i just pop in whatever is conveniently around. Which isnt always healthy food. Well i hope everyone else is doing well... Miss you all very much! It's been so long you all, but I'm still lurking. Finding time to do anything these days is hard as I'm sure you all know. Can you believe how fast time is flying??? You all sound well and it's good to read your stories and catch up. All well here. My wee Ollie is such a mummy's boy so it balances up with Sam who's a real daddy's boy . Ollie is doing well although still not putting on much weight (height great though!) and STILL not taking a bottle. I'm still feeding twice a day which is hard working full time. Work is a nightmare and I need to address the work/life balance, but apart from that, things are good. Keep happy and well everyone! Last edited by JustinesBaby on Sun May 11, 2008 8:04 pm, edited 1 time in total.